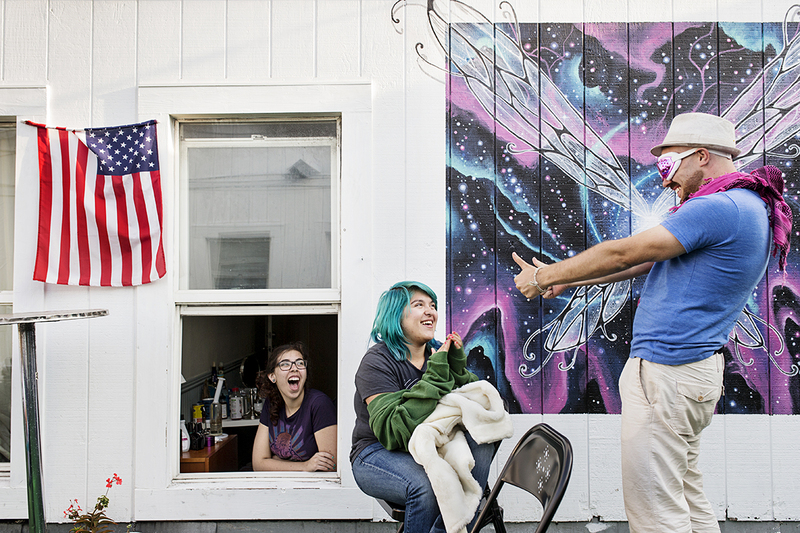 Adonis Gaitatzis (right) tries on costumes for Burning Man with his 20 Mission housemates Angela Van Den Eeden (left) and Vivien Castillo (center) while packing and preparing to head to the festival at the co-living space in San Francisco, Calif., on Monday, August 25, 2014. Around 40 people live in the building, which is a former single room occupancy hotel that had been vacant for several years before being turned into the co-living space. Many of the residents, such as Gaitatzis, are start-up entrepreneurs and the community is a mix of temporary occupants with people who have made the space their home on a more long-term basis.